Trabon MHH Divider Valves from MotionSource are basically the same capable design as the Trabon MSP Series, but with even tighter and more exacting tolerances. The Trabon MHH Series delivers highly accurate lube delivery for demanding high pressure grease and oil applications. 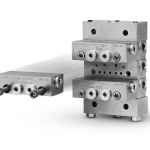 MotionSource is your source for genuine Manzel MHH divider valves from Graco. Trabon MHH divider valves are configured for a higher pressure for use in gas engines, compressors, and similar equipment at pressures up to 6000 PSI and 7500 PSI. MHH divider valves precisely proportion a volume of oil to satisfy the different requirements of every point in a lube system. They operate in sequential fashion to ensure that no point is missed. It’s series-progressive design provides ready monitoring capability. Trabon MHH divider valves are available for use with petroleum or synthetic oils and at pressures up to 7500 PSI. The modular, stackable sub-plate design provides maximum application flexibility. Accessory components are available for visual diagnostics and electrical monitoring. Lubricate up to 16 points from one divider valve assembly. Soft-seal O-ring construction and indicator ports minimize leakage and reduce maintenance. Built-in check valves prevent lube back flow and help keep lube lines full. Stackable sub-plate design simplifies build-up, installation and maintenance. Ample clearance between outlet connections for elbows and 3/8″ lube lines. Performance indicators, cycle indicators and proximity switches monitor divider valve action to simplify troubleshooting and repair. Choice of 70 Durometer Buna-N or 90 Durometer Fluor elastomer O-rings. Did you know your divider valve assemblies can be designed, built and installed by MotionSource? With a 24/7 full-service team, our Graco trained technicians speak your language and can complete assembly at our site or yours. Every unit is tested before shipment and 100% guaranteed. Order Today, Ship Today. Trabon MHH divider valves are in stock and available for same day shipping.